The following essay is a guest post by Jared Miracle, who recently completed his doctoral training at Texas A&M University under the supervision of Prof. Thomas Green and is currently on the academic job market. Dr. Miracle has conducted extensive research on Japanese and Chinese martial culture, cataloged much of the Robert Smith Collection housed at Texas A&M’s Cushing Library, boxed professionally in Japan, studied aikido and “old school” kenjutsu in Japan and speaks both Japanese and Mandarin. His dissertation research focused on the question of how East Asian martial arts came to occupy their present place in American society and culture. In this post he will be exploring another one of his research topics, exploring an idea that he calls “proxy violence.” I am very excited to be able to host this essay here at KFT and we hope to be hearing more from Dr. Miracle in the coming months. I have a friend who deplores the fighting arts. She doesn’t begrudge my awe at the aesthetic beauty of the more elaborate practice forms, nor does she seem to particularly care that I spend so much time mulling over the complex history and politics of a given lineage. What sets off her ire is the very thought of physical violence. Boxing, she says, is disgusting and should be illegal. MMA is nigh unthinkable. Even video games in which one character strikes another are anathema. And so, she argues, no one should engage in martial arts because their only purpose is to cause harm. This raised the question of what, precisely, we mean when discussing the astonishing variety of “martial arts.” In order to find that line, I began to pose hypotheticals. What about robots fighting? That would be alright. Insects? No, because they are alive. Digital humans? Absolutely not. Digital insects? This discussion brought up a topic that has been on my research plate for some time now: what I have termed “proxy violence.” By this I mean any physical antagonism in which the violence is carried out via mutual intermediaries. This includes the idea of medieval knights championing their superiors, but also cockfighting, video games that simulate arena combat, and any other activity that offers one or more levels of remove between the combatants and the parties in social conflict. It need not be argued that the martial arts have had an extraordinary impact on every culture, and most certainly on popular culture, however I would like to pose that they have played an especially large role in shaping one of the present day’s most enduring and globalized franchises and, in the analysis, that manifestation reveals a number of underlying associations, assumptions, stereotypes, and desires. This franchise, worth over $50 billion as of 2013, is the Japanese product called Pokémon. 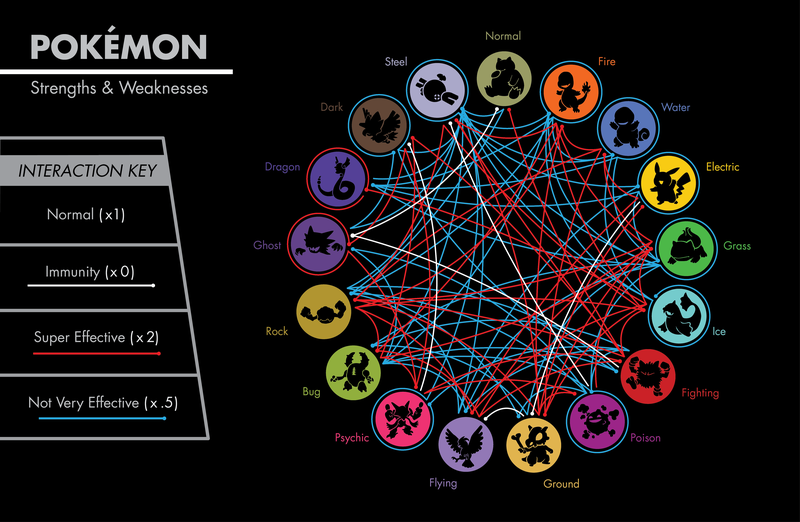 Pokémon operates on multiple levels simultaneously, making significant use of metanarrative to flesh out its imaginary universe. I’d like to discuss two broad categories in which finer definitions are contained: the in-game (internal) and of-game (external) elements. With regards to the of-game features, I’ve established elsewhere that Pokémon is really just the most recent manifestation of cockfighting. For those not already familiar, the concept behind this franchise is that there are hundreds of species of special creatures in the world that can be captured and trained to fight with one another in ritual combat, but that are also lovable companion animals. While Western cockfighting culture tends to emphasize the bellicose nature of the contest, its Chinese-derived analogue follows the opposite pattern—treatises on cockfighting and cricket fighting that date back to at least the thirteenth century focus on the amiable relationship between master and creature. 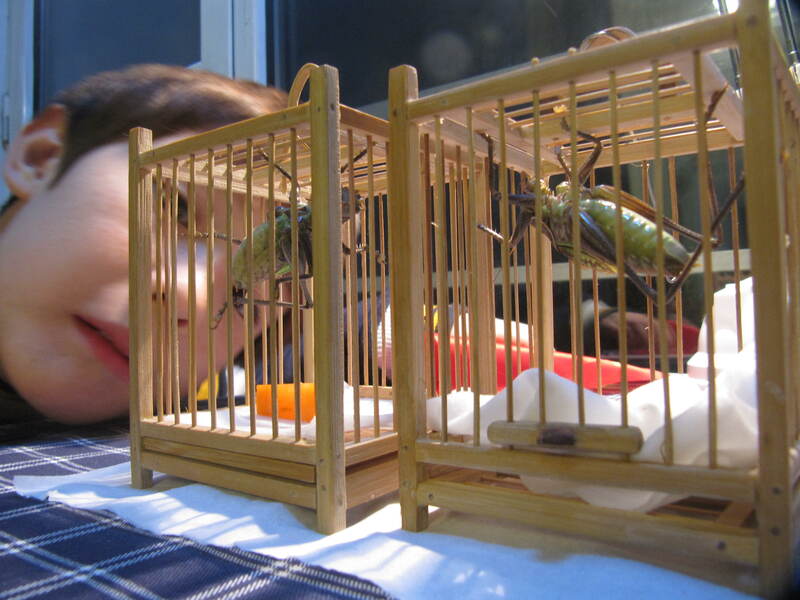 In China, cricket fighting was already big business in urban centers by the Tang dynasty (roughly 618-907 CE) as it was accompanied by gambling, community, and a swath of attendant commercial interests, such as people who sold stylized cricket cages, breeders, publications, and libations. The Tang period was also a time of heavy foreign exchange and it appears to have been around this time that the Japanese aristocracy took to keeping song insects as companions. It wasn’t long, naturally, before the masses caught on and the cycle repeated, with professional insect peddlers appearing in the written record around the seventeenth century. With the difference in available fauna on the Japanese archipelago, beetles came to be the favored fighting insects. “Beetle sumo” is still a very common practice in Japan, although, unlike in China, it is usually associated with childhood, the countryside, and a sort of general nostalgia. This prompted the creation of a digital version in the form of Pokémon, first as a video game, then a graphic novel, television show, and card game. A number of of-game derivations from martial culture are quickly apparent in the Pokémon narrative. Each creature has an elemental type with comparative strengths and weaknesses in combat, which is clearly culled from the five elements (wu xing) philosophy. This also goes along with the classic popular culture trope that styles of kung fu are inferior to some and superior to others, such as those on display in the much-loved 1983 film “Shaolin and Wu Tang.” The idea that the creatures are a proxy for the trainer harkens back to the notion of a single combatant representing his school, clan, or leader, and Pokémon’s stories always revolve around the protagonist’s ability to overcome numerically superior opponents by forcing them to accept defeat within the contest rules. These situations are reflective again of Chinese martial culture and resemble cases such as Huo Yuanjia’s (1868-1910) bouts with foreign champions. In-game, the connections with martial culture are sometimes even more explicit. One of the “elemental” types of Pokémon is termed simply “fighting.” These include characters such as Hitmonlee (a long-legged creature after the mold of Bruce Lee), Hitmonchan (a similar species with boxing gloves for hands, named for Jackie Chan), Throh (a red humanoid in a judo uniform), and Sawk (a blue humanoid in a karate outfit and with a striking resemblance to Mas Oyama). 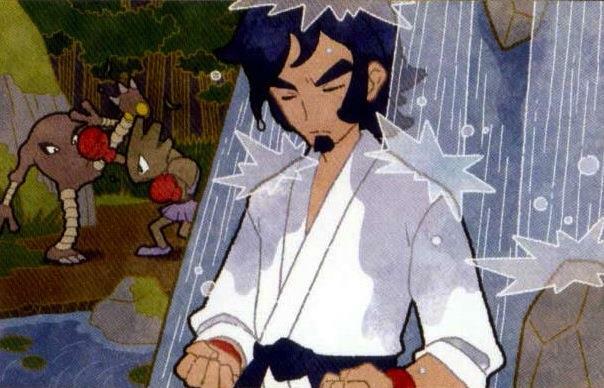 While the diversity of Pokémon’s species includes such homages, it’s interesting to note, too, how stereotypes of martial artists come into play. Rival trainers within the narrative are usually classified by a single descriptor. Some opponents are “black belts,” for instance, and are depicted as zealous karate practitioners who wear their uniforms at all times and train exclusively fighting-type Pokémon. Others include “battle girls” (dressed in a form-fitting MMA outfit), “ninja boys” (predictably costumed and specializing in poison-type Pokémon), and “experts” (in the garb of classical Japanese martial arts, often assuming an aikido stance). Other connections are less obvious, perhaps originating in the subconscious minds of the artists. 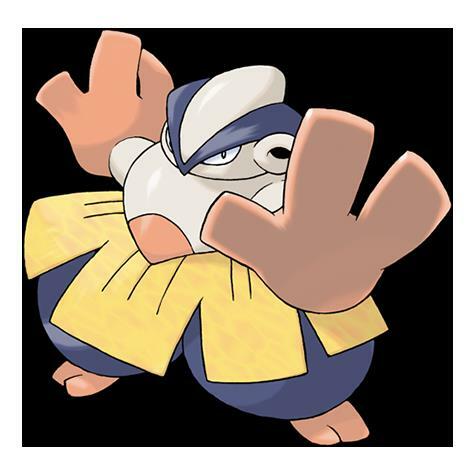 Take, for example, Hariyama, a fighting-type Pokémon modeled after sumo wrestlers. Its signature techniques are, of course, throws and palm strikes, however without some experience with both the world of sumo and some knowledge of Japanese, one may miss out on the meaning of its name. A popular open hand technique in professional sumo is the harite, or “needle hand.” In Japanese, the creature is known as Hariteyama, combining the sumo maneuver with the word for mountain. After having spent some time looking over the shikona, or ring names, of professional sumo wrestlers, one begins to notice a pattern: Miyabiyama (elegant mountain), Takanonami (wave of nobility), Kabutoyama (helmet mountain). Sumo names are frequently epic, perhaps to emphasize the formidability of the owner. So Hariteyama sounds like a wrestler’s name, but even more intriguing is its appearance. The character is styled with a design that looks quite Hawaiian, from the tropical colors to its grass skirted waist and even a pair of hands shaped like hibiscus flowers. Why converge sumo and Hawaiian imagery? Hawaii happens to be something of a sumo hotbed, producing champion wrestlers like Akebono and Konishiki. In the Japanese mind (to the extent that anyone may generalize), one connotation of Hawaiian aesthetics is, in fact, sumo. The above certainly makes for interesting trivia (to those of us who enjoy martial arts and popular culture, at any rate), but how is it relevant to scholarly discussion now known as martial arts studies? First, it illustrates the extent to which martial arts continue to shape global, economically vibrant brands, trends, and practices. It is unlikely, given Pokémon’s target demographic, that an inordinate number of martial artists can be found among its fans. Rather, the depth of connection between the franchise and martial culture is highly indicative of that between martial and general culture. The narrative features several stereotypes of the fighting arts and their exponents, which points to their prevalence in at least the society from which it springs, if not globally. Third, acknowledging that the organized battles taking place in Pokémon’s imagined universe are essentially a fantastical form of cockfighting or insect fighting invariably compels us to consider why much of the literature on arena combat compares human and nonhuman participants on equal footing. Even Epictetus sees little difference between a gamecock and a wrestler: “Only do not through a habit of doing the same thing [renouncing the combat], begin to do it with pleasure, and then like a bad athlete go about after being conquered in all the circuit of the games like quails who have run away.” Gamecocks, crickets, and beetles must be trained for their fights, just as humans. Their psychological state is as important as that of human fighters in achieving victory, and the consequences of a defeat can be just as severe. Are martial arts purely a human phenomenon? I don’t have an answer to this question, but I would argue that any definition thereof must include, as Green and Svinth (2010) do, the notion of nonhuman or “extrahuman” allies. Let me be clear: I am not claiming that animal combat should be considered a martial art (although the number of systems and styles in imitation of or supposedly descended from nonhumans is astonishing). Rather, my goal has been to illuminate the fuzzy lines between human and nonhuman combat as well as those between participants, trainers, and spectators. This is an established matter, as Geertz (1973) wrote about in his Deep Play. He argues that the Balinese cockfight is a drama so intense, economically (men will bet their entire life’s savings on a match), socially (the amount of prestige won or lost on a particular gamecock can make or ruin its owner), and psychologically (depression and elation), that it can only be called “deep play,” a form of play so dangerous that involvement is illogical, and yet people continue to do so. In the narrative of Pokémon, this is certainly the case. For the real-world people who participate in it’s tournament structure, fortunes and lives may not be on the line (although a surprising number of my informants have disclosed the formidable sums they’ve accrued over years of playing), but the games are just as intense socially and psychologically, as a boxing match may be for an avid spectator, and just as Huo Yuanjia’s matches with foreigners were for much of the Chinese population at the turn of the last century. The point, as I have tried to relay time and again to my friend who abhors the martial arts, is not the combat itself, but the communities that are built by and around it. People and their nonhuman companions, real and imaginary, require communities in order to become stronger, and that strength derives not just from physical training, but from the bonds we form with one another. This is something I’ve found iterated time and again by martial artists and Pokémon players alike, and suspect that it rests at the core of any endeavor to improve self and society. I think the use of the term “combat sports” is probably more applicable than ‘martial arts’ throughout this type of discussion. While this will, I believe, change the dynamics of academic discourse on the subject it is an important distinction that needs to be made in serious research. I did however like the article as it touched upon gaming and other areas from my past design research. Continued success.